Business premises on North End, vacant as of March 2019. It was previously a branch of HMV photo, but this closed down in early 2019. According to a photo on Flickr, as of 1989 the premises were occupied by a business called Hornes. According to another, Hornes was still there in December 1990 (most easily visible at original size). As of January 2012 it was a branch of JJB Sports photo, but the entire JJB Sports chain went into administration in October 2012. Several JJB Sports branches were purchased by Sports Direct, but the Croydon store was not one of them photo of notice. In April 2013, a clothes shop called Fashion 4 Less opened on the premises. 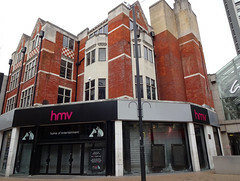 As of early August 2014, the Croydon Guardian reported that a branch of HMV would be opening on the premises on 4 September. Fashion 4 Less continued to trade there in the meantime, albeit with "Closing Down Sale" notices in the windows photo stating that the last day of trading would be Sunday 17 August photo. Fashion 4 Less had indeed vacated the premises by Monday 18 August photo. As of early September 2014, the Croydon Advertiser further reported that the opening has been put back to 11 September, and indeed on 3 September it didn't look quite ready to open photo. On the morning of 11 September there were staff in and out getting it ready to open photo. It was definitely open by 18 September photo. This marked the return of HMV to Croydon after the March 2013 closure of its Centrale store. However, as of January 2019 there were signs in the windows advertising a closing-down sale photo, and their Twitter account announced that their last day of trading would be 24 January. It was definitely closed by March 2019. Last edited 2019-03-08 15:15:57 (version 56; diff). List all versions. Page last edited 2019-03-08 15:15:57 (version 56).